A friend recently sent me a link to a blog post by the author of the XKCD comic, in which he talks about being distracted from real work by browsing the Internet. Clicking around on the internet can give us an immediate sense of having accomplished something, which triggers feel-good chemicals in our brain, even when we aren't really being productive. Housework or complex projects don't give you that sense of accomplishment (and the associated chemical response) every few seconds like browsing the Internet can. I have been playing Facebook games for several years. I have been careful about how many I play. I limit myself to two games, and to reduce the temptation to try out any new ones (I love to try new things on the computer!) I use Facebook's 'block' feature. I block notifications from every game that shows up in my newsfeed. The block feature is great. Once you block an app you will never see an invite or notification from it even if your friends send them to you specifically. For a while I was blocking several apps a week. Now I rarely see a new one. I have been less inclined to try out new games since I see so few new game notifications. That is good. But I still allow myself to play up to two games. Lately I've been playing CastleVille. I like it. 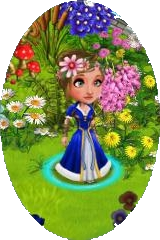 My avatar has a pretty renaissance dress. The quests give me goals and are complex enough to make me have to plan and prioritize my resources. But when I log in every day (or twice a day) to work on my quests I don't get other things done. Like putting the laundry away, doing the dishes, or blogging. Also, 2Flowers is not entertained by CastleVille and often demonstrates that she would like my full attention. For a while I was likening my playing CastleVille to the Lost Boy reading comics online. It is important to have something that you enjoy doing to unwind. But I spend a lot more time on CastleVille than he does on comics. And the comics make him laugh. I'm thinking about deleting CastleVille. I think I would need to delete it in order to stop logging in every day. When I think about deleting (blocking) it, I feel like I don't want to. I think: What about my CastleVille friends? Some of my Facebook freinds play CastleVille too and I feel like I interact with them through the game. I don't really. But I kind of feel like I'm saying "Hi!" when I visit their kingdom and do stuff there. And what about all of the work I put into developing my kingdom? If I block the app I'm just throwing that all away! But what am I throwing away? A pixelated picture, that's what. The part that is hard is that I'm throwing away all the time I spent to make that picture. But the time is already kind of thrown away because the picture doesn't really enrich my life in any meaningful ways. I have this same problem with FarmVille. I haven't played FarmVille for about two years, but previous to that I played it a lot and built a ginormous farm. 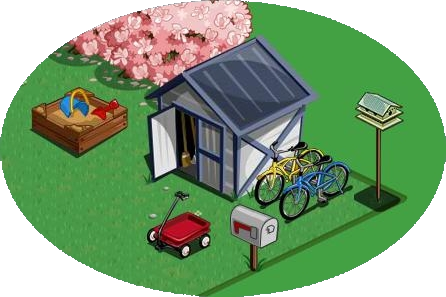 I was rather pleased with my FarmVille orchard, and my shed with a bike for Lost Boy leaning up against it. When I weigh the pros and cons I see that there are only pros to deleting these apps, and the cons are superficial. I think I may be ready to delete FarmVille. And I think I need to delete CastleVille.